Viewing from a distance, through the lens of news coverage, the situation in Crimea, I’m struck by the danger of escalation and how easily a destabilizing bad precedent can become established. The unilateral action Putin has taken in annexing Crimea, ostensibly in solidarity with its majority Russian-speaking population, leaves plenty of room for other nations to follow. Imagine China waltzing into Taiwan, emboldened by the relative paucity of any ‘diplomatic’, non-military response? Of course, any armed confrontation between nuclear powers would be cataclysmic and must be avoided at all costs, but roots of this present crisis must be traced back to the Arab Spring and specifically the Syrian Civil War. Here, Putin learnt that Western threats and wishes could be ignored and Russia could act as a regional power, able to prop-up compliant dictators and flout those with more scruples through covert action to bolster the incumbent regime. Interestingly, all of this unrest flows partly from the destabilizing impact of the global downturn from 2008, which has heightened the misery of individuals underneath the heel of totalitarian government. There’s a parallel with the famous Wall Street Crash and subsequent worldwide belt-tightening (c. 1929 onward), which also resulted in increasingly bellicose and aggressive nationalist wars. From the Italian Mussolini’s takeover of what was then called Abyssinia in northern Africa to the Japanese juggernaut grabbing Manchuria, Hitler learned that there was little appetite for any efforts to stop such territorial aggrandizement. The UN’s precursor, the League of Nations, proved completely ineffectual in guaranteeing national sovereignty, and the main powers were too committed to isolationism, appeasement… any solution that did not involve another appallingly costly war. Tragically, only the force of arms could stop Adolf Hitler’s Armageddon. I hope and pray that Putin’s plans – whatever exactly those are – prove less blood-drenched. May the God of all grace protect and shield us, enabling us to care for one another, just as He loves us. Outside my place of work, the front section of an old RAF Nimrod aircraft is parked, ready to help celebrate and educate about “The Triumphs of Transport” as part of Moray College’s annual Science Festival. You may remember that these aircraft were scrapped by the government in 2010 as part of the Strategic Defence Review. However, their wide range of sensors mean they are excellent for search and rescue mission, such as the hunt for lost Malaysian airlines MH370. Tragically, one part of Britain’s ‘defence’ capabilities with the potential to save lives during peacetime and ease suffering was deemed surplus to requirement, which seems rather indicative of the UK’s current spending priorities. In 2013, Britain invested £11.3bn (or 0.7% of the overall budget) in the future stability and prosperity of struggling, war-stricken, debt-laden countries around the world, in which over 1,000,000,000 people live on less than a dollar a day. This number, however, needs to be set in context. For example, £126.2 billion was pumped into Health Care – at least £9bn. treating obesity & smoking-related illnesses, which are the direct result of people’s own foolish, short-sighted lifestyle choice. £138.1 billion, meantwhile, was paid out in British pensions, irrespective of individual’s savings or private arrangements. Looking at these issues from a historical perspective, the British Empire (c. 1689 – 1950) was responsible for plundering many parts of world for their own national benefit, maximised through the lucrative (yet socially disastrous) tobacco & slave trades. Politicians and generals determining boundaries in Africa and Middle East, including conflict-ridden states such as Iraq or Democratic Republic of Congo. In fact, historian Stuart Laycock has calculated that the UK has invaded 9 out of 10 countries globally over the course of history. Whilst many in the Britain lambast what they see as ‘their’ money disappearing overseas, clearly the UK International Development budget is only a small step towards righting ancient wrongs. I’ve blogged on this old sawmill site before, but just imagine – for a moment – what a group of committed volunteers with a little bit of funding could do. 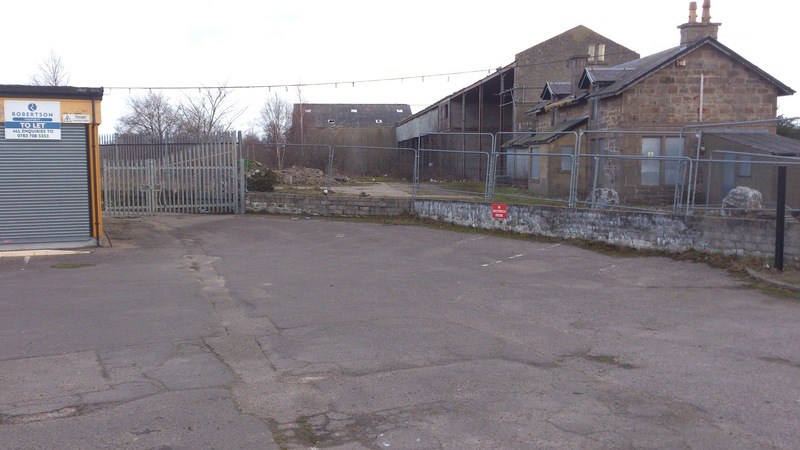 The Carnegie Trust are offering £2500 to project designed to improve public spaces. This sad eyesore could become a place that everyone can enjoy and appreciate. Here’s what I’d do, if I won the award (look out for the photos at the bottom of this page which will help give a clearer idea of the plan). 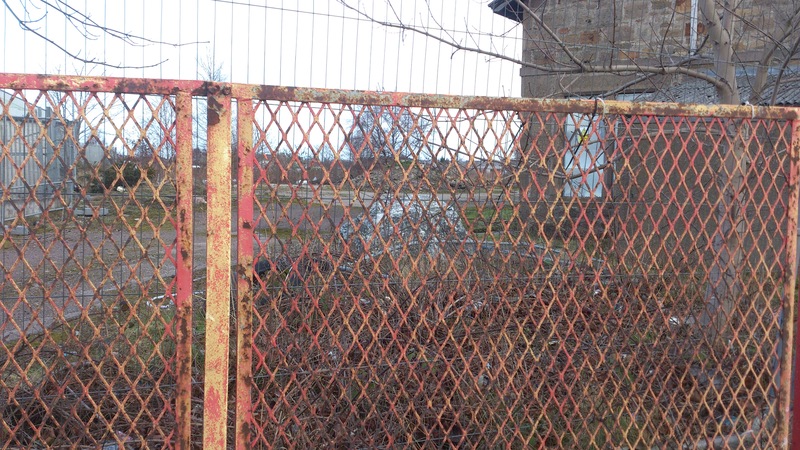 1) Contact the landowners (Robertsons), offering the £2500 if they will agree to demolish the remnants of that old saw mill and remove the metal mesh barricade temporary fence which currently surrounds the site and is rather ugly. This alone would immediately improve the aesthetic appearance, brightening-up the four homes who live directly in the shadow of this huge wall and opening-up the whole area. 2) Advertise for and lead litter picks onto the site to pick-up all the detritus that no-one has been able to sort out in over three years. 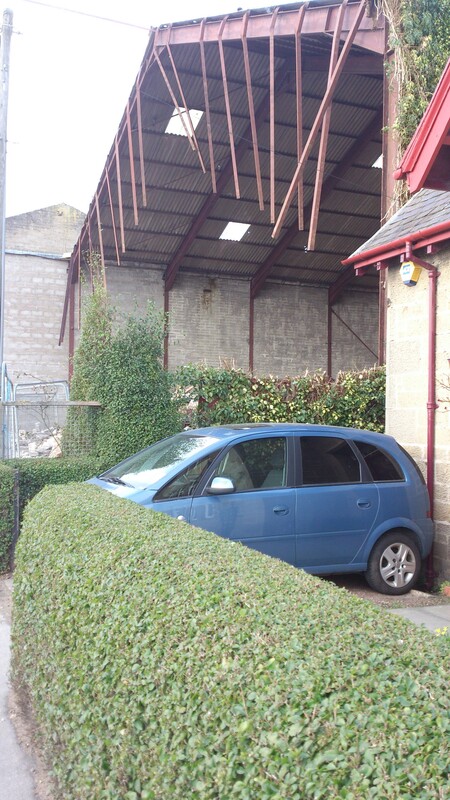 This would take a while, but again would help to make the whole area look more natural and appealing. 3) As part of a group, create a path that runs right through the area and allows people to explore this natural, ‘wildneress’ habitat. 4) Harvest the numerous bramble bushes in early autumn. If Asda can sell punnets of blackberries for about £2, then there’s a real potential to make money that could be funneled into improving the site. 5) Gathering volunteers to construct a proper fence, but note that the foliage already in existence creates a reasonable natural barrier. 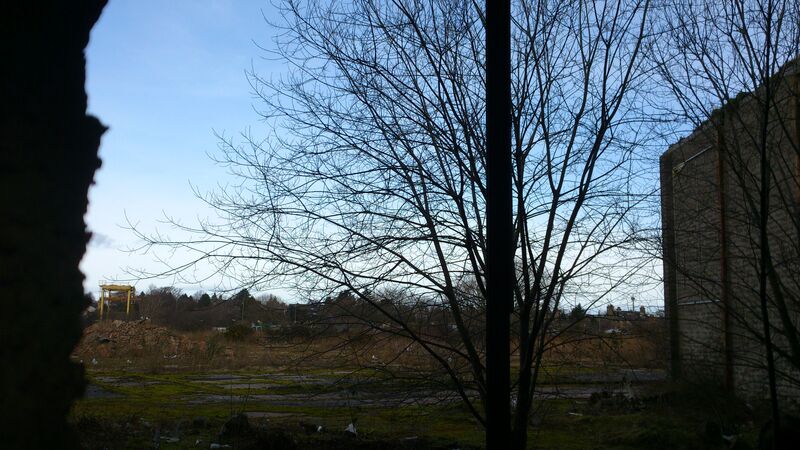 6) Longer-term, parts of this area could be turned into allotment gardens. 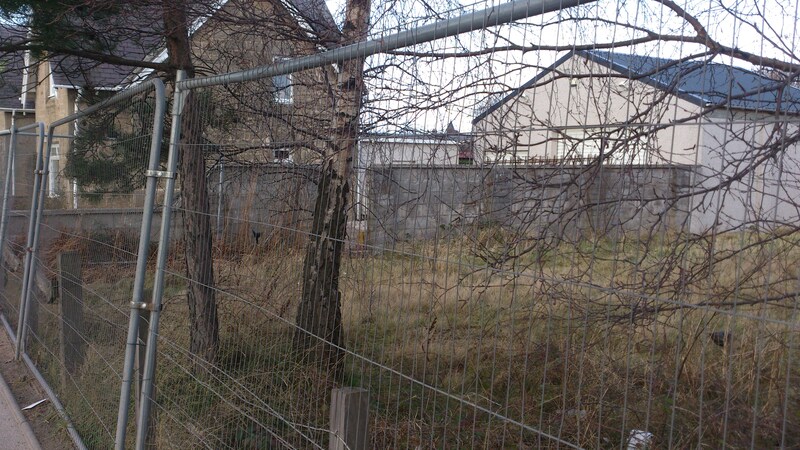 7) Of course, anyone could buy and develop the site at any point, but no money would be wasted. 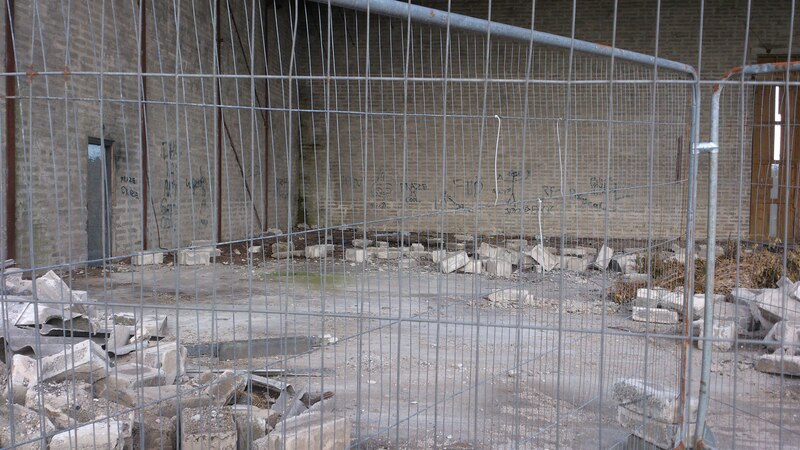 Moreover, it’s unlikely that the site would be touched anytime soon as there are plenty of areas to build in Elgin and other parts desperately in need of regeneration. The fact is I pass this derelict eyesore everyday and would jump at the chance to make a difference. So many people feel ‘down’ about their neighbourhood because the ruined relics of our more industrialized past still haunt us today. If we prioritize the redevelopment of these sites, I believe that we would majorly improve people’s mental (and physical) health. They would be more interested in going for walks and uplifted by the wonderful examples of natural life all around us. 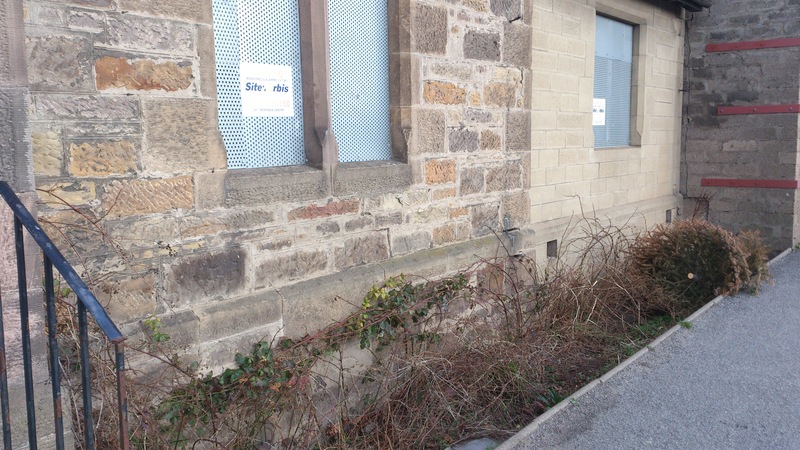 Councils are strapped for cash, but I hope that individuals, voluntary organisations and the likes of the Carnegie Trust can make miracles happen in the most run-down areas. Packed with potential but needing funding and volunteers to make changes happen. Next to the old saw mill is a empty retail unit. I imagine this would be easier to rent-out if the area much tidier and neater. 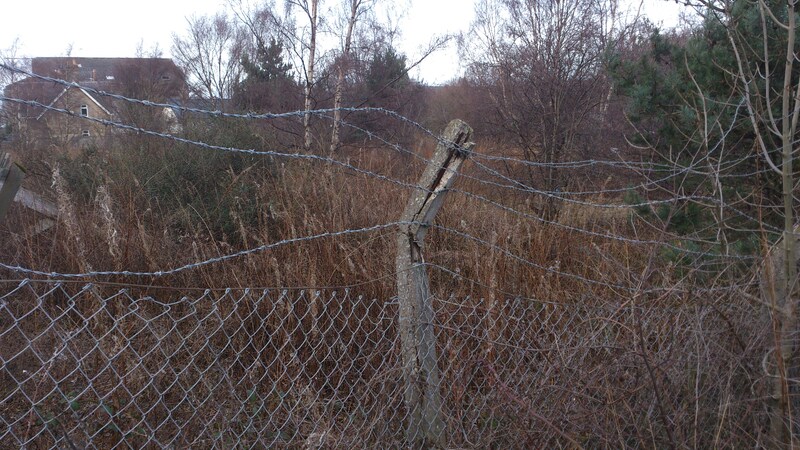 One of the most unsightly fences ever designed by man! Another patch of brambles that could be cultivated and harvested as a source of revenue. View through a small hole in the wall. Sadly, graffiti becomes a problem in run-down parts of a city. I’ve heard the claim that the land is contaminated, but it still seems to provide good nesting for seagulls. I’d rather risk a clean-up than always have this blight on the landscape. 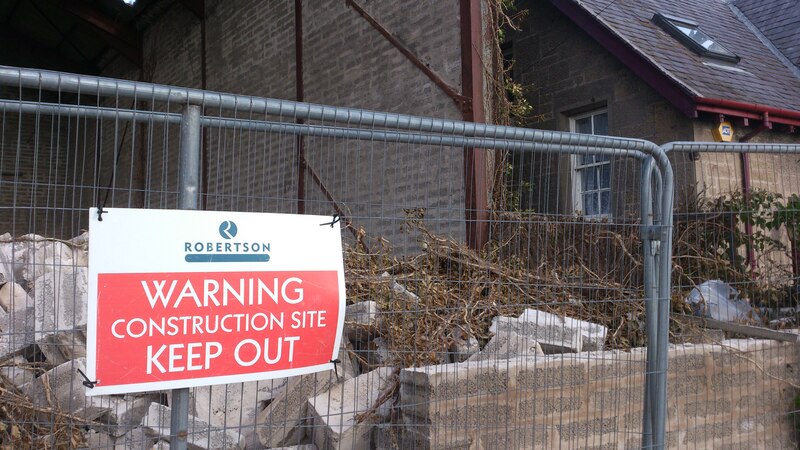 Ironically, Robertson stuck up this site, but there has been no sign of any “construction” in many years. 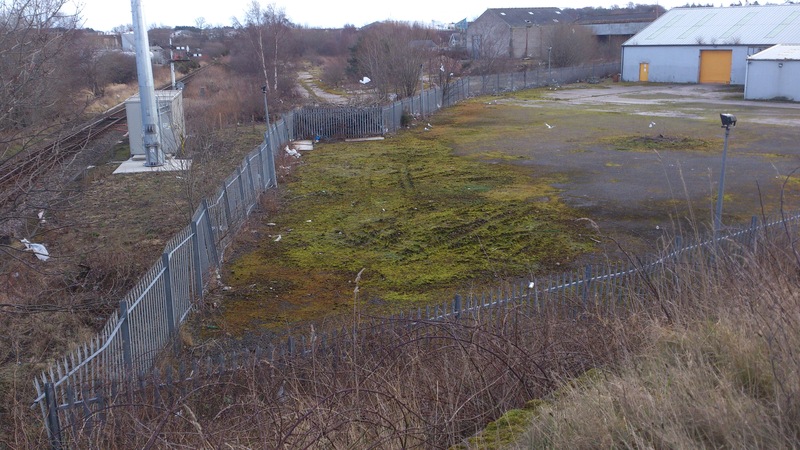 Why do Local Authorities allow companies to sit on land that is maintained so atrociously? Another view of the house that should have much more natural light and not border directly onto an abandoned factory wall. House at the other end of the row. As you can see, the large warehouse was partly ripped down. The cause was violent winds around about Christmas Day 2013, but they show us a glimpse of what life could be like for these residents – if someone cared enough to finish the demolition job! 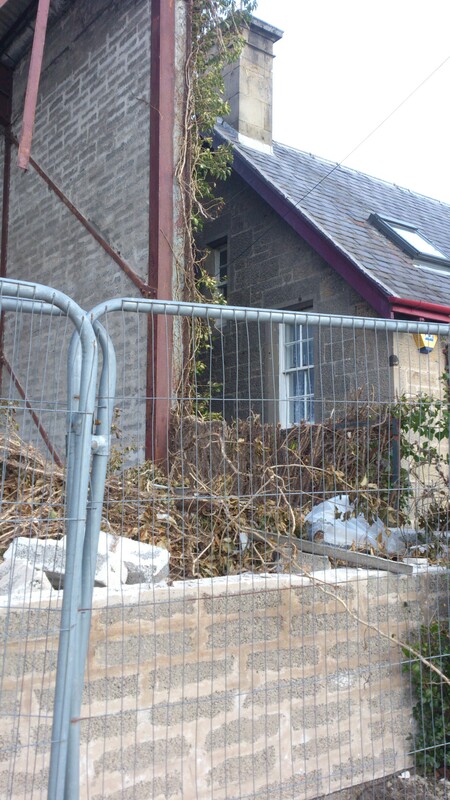 One of the houses which borders directly onto the site of the old, derelict sawmill. I feel so sorry for those live here as their view could be much better. 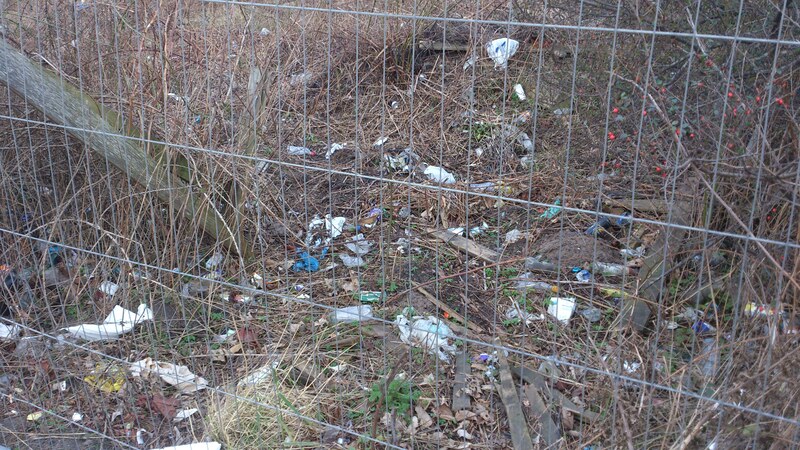 Another view of the obscene amounts of rubbish that deface this potentially beautiful landscape. 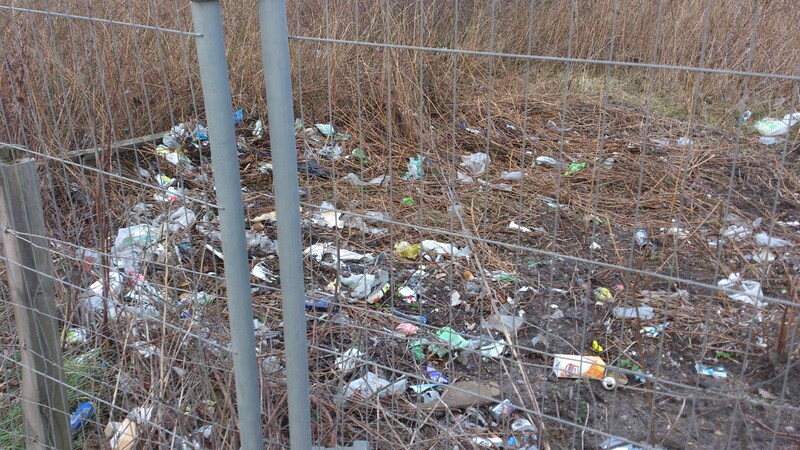 Litter behind ugly metal barricade that needs cleared-up but currently can’t be reached.